A technological innovation that was developed in China nearly a decade ago but gained little traction elsewhere is potentially poised to make a serious challenge to the world’s most powerful mobile money MNO, Kenya’s Safaricom. SIM overlay technology, sometimes called a “skin SIM”, was pioneered by the Shanghai-based tech company F-Road to meet the demands of Chinese customers who frequently found that their mobile phones were roaming when traveling outside their home province. Taisys and Digitech have in recent years brought forward their own similar technologies. 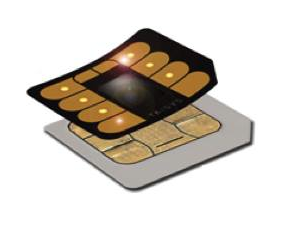 SIM overlay adheres a paper-thin plastic sheet embedded with a number of contact points and a chip on top of a standard SIM card. This then allows additional functionality to operate independently of the SIM itself. Digitech’s Bibitel, for example, allows cheap international calls to be made, while in China the SIM overlay has helped facilitate access to branchless banking services for customers of many of China’s smaller banks. It is clearly a technology that has the potential to be the basis for innovation. In Kenya, innovation has come in the perhaps surprising form of Equity Bank. Despite, or perhaps because of, being the country’s largest bank, in recent years Equity Bank has struggled to compete with Safaricom’s M-PESA mobile wallet, even though Equity Bank teamed with Airtel, Kenya’s second-largest MNO, as a partner in Airtel Money. Airtel, Econet’s Yu and Orange have all launched their own mobile money offerings but they have failed to make but a small dent in either or both of Safaricom’s or M-PESA’s dominance of their respective markets (Safaricom has a 73% share of the mobile market in Kenya, while there are over 17 million M-PESA account-users). Some believe that this has led to monopolistic tendencies on the part of the market-leading MNO, which is also part-owned by the Kenyan government. Regulators have recently been examining Safaricom’s potentially unfair dominance, and they are shortly expected to announce that Safaricom must open up its M-PESA agent network to allow users of Orange, Yu, or Airtel to cash-in and cash-out. A more direct challenge for business is looming, however, in the form of Equity Bank’s acquisition of an Mobile Virtual Network Operator (MVNO) license. Finserve Africa (a subsidiary of Equity Bank) will be joined by Zioncell Kenya and Mobi Pay’s Tangaza Pesa as MVNO’s piggy-backing on the Airtel network. Safaricom customers will now be able to get access to Equity Bank’s mobile services through the Overlay SIM, which will also carry the transaction data on the Finserve Africa MVNO. Safaricom customers will be at liberty to use either their Equity Bank account or M-Pesa’s mobile wallet, and of course they will not have to change their preferred mobile money wallet should they decide they preferred an alternative MNO. It is already clear that this development is widening customer choice and cutting prices. Operating as an MVNO offers Tangaza, for example, the opportunity to cut its prices below those previously charged for its service by Safaricom. For Equity Bank’s part, the FinServe Africa MVNO will integrate all its banking services into any mobile phone (whether smart- or feature) that contains the SIM overlay, giving Equity Bank even more flexibility in terms of pricing structure across its suite of services, potentially leading to a mobile money price war that will be good for consumers. The bank intends to charge just 1% on P2P transfers, compared to what Equity Bank claims is a prevailing “market” rate of 16%. There will be a fee cap of KSH 25 irrespective of the transferred amount. A transfer of KSH 70,000 would incur a fee of KSH 110 if carried out via M-PESA. Cross-border transactions and the direct receipt of international remittances are also available to users, putting Equity Bank one step ahead of M-PESA in this lucrative market. Equity Bank also appears to be gearing up to leverage its Eazzy Loans book to challenge head on M-PESA and Commercial Bank of Africa’s M-Shwari loan product, offering as it does loans at a maximum interest of just 2%. In a further innovation, Equity Bank’s Overlay SIMs, which will be distributed to customers by the bank with instructions on how to attach them to their MNO-issued SIM, will be NFC enabled. This opens up a second front in the Equity-Safaricom war in Kenya, where Safaricom has invested heavily in acquiring small merchants to accept M-PESA as a direct payment method. The MNO has faced a somewhat steeper challenge on this side of the business than it did in its tremendous spurt of growth in acquiring customers for M-PESA. Nonetheless, it is believed that 120,000 businesses have signed up to accept M-PESA as a means of payment, though only 20,000 are active – ratios not unlike those between active and inactive registered customer users of many mobile money platforms. M-PESA’s 1% fee is clearly an attractive proposition to a small business and is one that the banks and mPos just cannot beat. It would appear that with the inclusion of Visa and MasterCard compliant NFC capabilities in the SIM overlay, Equity Bank is leading the charge for the banks in hoping that convenience of use for the customer may drive acceptance and adoption. Equity Bank’s bold move to challenge Safaricom and M-PESA comes at a time of growing realization among all major MFS stakeholders in the region that Safaricom was going to have to give some ground before even more was taken away from it. Unfavorable comparisons with neighboring Tanzania’s ground-breaking interoperability agreement may also have played a small role in creating more drive towards a genuinely competitive market in Kenya. As Bill Maurer, head of the Institute for Money, Technology and Financial Inclusion at the University of California, Irvine, commented on M-PESA’s impressive innovation, “But gosh, wouldn’t it be great if there was a competitor.” That competitor was never going to come as long as Kenya’s banks either failed to reach out to the unbanked or used M-PESA as the platform across which they attempted to do so. Equity Bank saw a unique opportunity through the combination of an MVNO license and an Overlay SIM to potentially break the mold of MFS in Kenya once more. As with the beginnings of M-PESA, where it will all lead right now, is anyone’s guess.